It looks like two great new sales just opened on Zulily! Visit the Disney Princess Collection Sale and find clothes, accessories, home decor, toys and books all priced at up to 75% off retail prices! 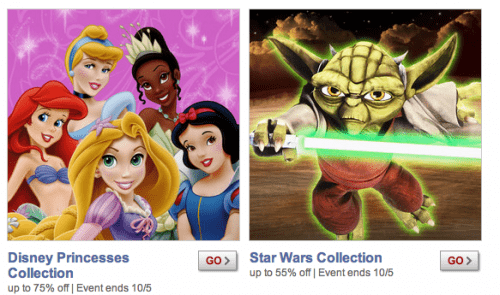 Check out the Star Wars Collection and you'll save up to 55% on clothes, toys, books and more! Use Zulily.com promo code ZULILYGA04 to save $5 on orders of $50 or more.